School Closures Pit Race And Poverty Against Budgets What was once a local issue is growing into a nationwide concern, as civil rights activists argue that school closings are disproportionately hurting minority communities. But cities are in a bind with budget shortfalls, and closing under-populated schools may offer a way to cut costs. Jean De Lafayette Elementary School is one of 50 schools slated to be closed in Chicago. Cities across the country are facing similar decisions, and opposition to the closures is growing. 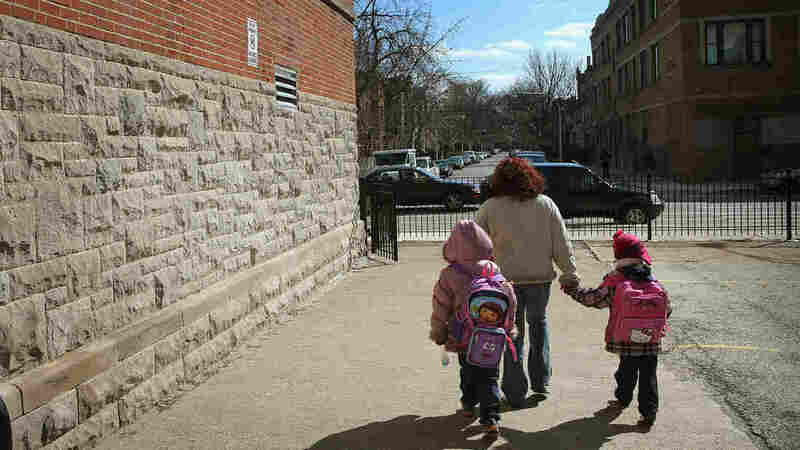 In Chicago, parents are fighting to prevent the city from closing 54 public schools. The Chicago Teachers Union is planning a rally against the cost-cutting proposal next week. School closings are nothing new, but in a growing number of districts around the country, what was once seen as a local decision to close schools has now morphed into a politically charged campaign. People opposed to school closings have almost never organized beyond their own neighborhoods, let alone marched on Washington, until recently. Helen Moore, a community organizer from Detroit, joined more than 200 protesters from 18 cities in January to call for a moratorium on school closings nationwide. "I came here to demand. I ain't asking for not a damn thing," she said at a rally in Washington, D.C. "I'm telling you that I'm demanding an education for our children. They are our schools, they are our children, it is our money." In cities like Detroit and Flint in Michigan, Oakland in California, Chicago, New York and Philadelphia, schools are closing because they're half-empty. The reason they're half-empty has intrigued researchers like Emily Dowdall with The Pew Charitable Trusts. "We were actually pretty surprised to find that no one else has taken a comprehensive look at this issue," she says. Dowdall co-authored two recent studies examining school closures in 12 cities, and she says two trends stood out. "The number of school-age children is falling in these cities, even in cases where the overall population is up," she says. "The second main trend is the growth of charter schools, which has just been very rapid, very massive over the last decade or so." On the national stage, civil rights activists argue that school closings are disproportionately hurting poor, minority communities. Dowdall says Pew did not do an analysis to see if that was true. But her research focused on 12 overwhelmingly minority, urban school districts experiencing lots of school closings. Dowdall says it is happening in more and more places. "It's not isolated in one or two cities that have lost lots of population. It's actually very common even in cities that are seen as economic successes, like Washington, D.C., like Chicago," she says. That's why school closings are getting more attention, and community activists blame the Obama administration for letting it happen. The stated goal of the administration's education agenda is to shut down failing schools and promote the expansion of publicly funded, privately run charter schools. Michael Casserly, head of the Council of the Great City Schools, says charter schools are siphoning off kids from traditional public schools, especially in the inner city, where charter schools have grown the fastest. "I think the administration should be mindful of the backlash that it's getting on that," he says. The backlash has been especially intense in school systems where children have been forced to transfer to rival neighborhood schools, where their safety has been a huge concern, or in districts where the students transfer to schools that are overcrowded and academically no better than the schools that closed. But Casserly says the key justification for closing schools is money — districts cannot afford to keep half-empty schools open. "That's why this situation is so difficult," he says, "because schools play a very, very important role in the neighborhood and the community. On the other hand, the ongoing economic pressures necessitate cost-effectiveness that the taxpayers raise." That's an argument community activists like Jito Brown from Chicago rejected when he came to the rally in Washington. "You're looking at communities being destroyed, ripped apart. Outrage is everywhere," he says. At least 10 cities have filed complaints with the Education Department's Office of Civil Rights since January. Another 33 complaints in 22 states are pending, but there's no indication that school closings will stop anytime soon.